This document serves as a guide to good practice for the collection and archival of point cloud datasets and the additional derived products produced by terrestrial laser scanners in cultural heritage applications. It is recommended to read this guide in conjunction with Section 7 of the Metric Survey Specifications for Cultural Heritage (Bryan et al 2009) titled 'Standard Specification for the Collection and Archiving of Terrestrial Laser Scan Data' published by English Heritage. The Metric Survey Specifications for Cultural Heritage provides an excellent foundation for discussion of key project elements particularly project planning, data collection, and preliminary processing of terrestrial scan data and many of these points will be reiterated throughout this document. This guide builds upon the specifications provided by the Metric Survey Specifications for Cultural Heritage by broadening the scope to include such topics as accurate RGB/color acquisition and by also suggesting standards for archiving the derived products of point cloud datasets. Other key resources that were influential in the creation of this guide are 3D Laser Scanning for Heritage (English Heritage 2007) and Theory and Practice on Terrestrial Laser Scanning (3D Risk Mapping 2008). This guide is not a "How To" document that describes methods for collecting and processing scan data but rather a guide to inform individuals of key considerations and metadata elements to document in scanning projects that will allow them to easily archive and reuse their heritage datasets. 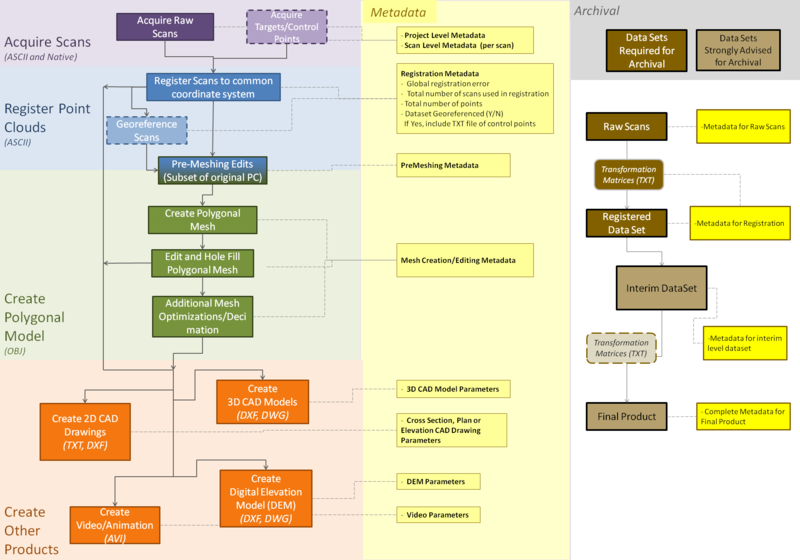 The graphic below shows the key steps of data acquisition and processing, metadata documentation, and data archival for laser scan datasets. These key areas form the basis for discussion for Sections 2 and 3 of this document; Section 1 provides introductory material and Section 4 provides a case study and sample metadata. It is our hope that the metadata elements discussed here will easily integrate into most heritage scanning projects and will promote the ease in archiving and the long term preservation of these valuable datasets.